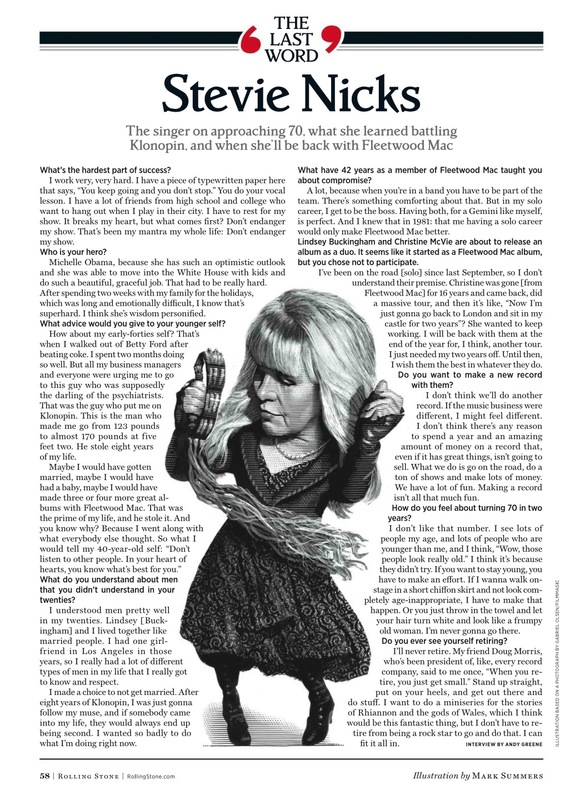 Stevie in the newest Rolling Stone magazine. All her interviews always touch me. I don't know what it is. I feel so connected to her person. "Don't listen to other people. In your heart of hearts, you know what's best for you." can someone turn that into one of those quote pictures? After she said she doesn't see a Mac album happening again I wish they had hit her with a follow up question to ask if she feels the same way about recording solo. It would have been interesting to hear the answer in light of all the "music business just isn't the same, so no point in making any new records" stuff. I don't always agree with some of her choices, but Stevie never fails to inspire me, particularly on her perspective and attitude on getting older. It's exactly what I needed to hear today. She remains an inspiration to me, even after all these years. "Hit the stage...dancin'..."
Fantastic, she's been really active this last period. why ? and for a solo record if a MAC record won't sell why waste time on a solo record ? Last edited by olive : 03-10-2017 at 10:53 AM. Don't you know that the stars are / A part of us? she needs to be let go . Last edited by olive : 03-10-2017 at 11:27 AM. "Do a ton of shows and make lots of money"
Why is she talking about 'making money'? She's worth a fortune and she's making a ton of cash on her current tour. I don't understand her thinking there. yup, it's a total double standard. When discussing IYD she said she didn't care if it didn't sell, she was making it for herself. And now suddenly the issue of sales is relevant again? She's not recording with FM because she doesn't want to make a record with Lindsey. I think it's that simple. they all take fans money not just her, she's not interested in recording with them, accept it its her choice. I always choose to think that when she now talks about making touring money with Fleetwood Mac, she is speaking as someone who wants to make sure that Mick and John are getting fresh cash in their piggy banks every few years. I think it's now only out of a sense of loyalty and care for John and Mick that she would even consider another 135 shows at 70 years of age. Fire away.